In CLADCON , a layer of silver alloy forms the contact surface. The rest of the head and the shank are made of copper. Contact surface layer and backing metal are bonded metallurgically. This ensures the electrical and mechanical properties of CLADCON are as good as solid contacts. 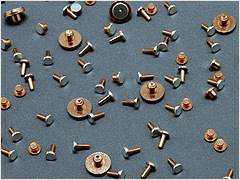 Electrolytic Copper provides better thermal and electrical conductivity than silver alloy and copper shank in CLADCON ensures longer life. With increasing silver prices, lower silver content of CLADCON allows choice of larger contact than with solid silver contact to get better current rating. Founded in 1965, Modison, had only trading activity. The first manufacturing unit was established in 1975 for refining of Silver. Modison was instrumental in establishing '999' Good Delivery Silver Bars in India for bullion trading.Within two years thereafter, Modison started producing Electrical Contacts and Contact Materials for the switchgear industry. From 1983 to 1996, Modison had Technical collaboration with DODUCO, Germany; which enabled Modison to develop many hi-tech products which were hitherto, imported by Indian Switchgear Industry. Today, Modison has 3 manufacturing facilities strategically located at Mumbai, Vapi and Silvasa, which are run by more than 400 highly dedicated personnel. The product range includes large variety of electrical contact materials and finished contacts for LOW, MEDIUM & HIGH voltage switchgear industry. At Modison, We Are Committed To Meet And Exceed The Expectations Of Our Customers, Employees And The Stakeholders By Providing Zero Defect Products With World Class Services.